Michael Starobin – 1AU Global Media, LLC gave a brilliant presentation about creativity in leadership at the Leadership Breakfast of Maryland recently. 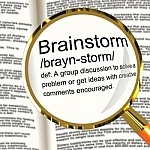 One question he asked: 'brainstorming' – is this a creative exercise? WOW! This is popular exercise for organizations – business and otherwise – all you need is a flip chart to record what the group is saying. The facilitator writes what's been said, sometimes asking for clarification. Unfortunately, the initial results resemble a marching band that has no leader and no practice, so each member does their own thing. Chaos! IF the group gets to problem solving, it is likely to be rushed in the final 30 minutes of the session and may not be addressing the real problems at all. Years ago I was meeting with key managers about upgrading our network and computers and trying to figure how to get the biggest bang for the buck. Money was an issue (of course) but productivity was waning due to network/hardware failure. My brainstorming group was moving steadily to a three year phase-in of complete replacement, funded from cash flow, when another manager stuck her head in the door to see what we were up to. Hearing we were working on the problem of updating the network without sufficient funds, she asked if we had considered leasing the software/hardware. BOING!!! We were solving how to stretch cash, but she saw the problem as investing in productivity and effectiveness. Switching gears, we got all the equipment and solved the right problem as a result of that change in focus. Isn't it more useful to charge the stakeholders with defining the problem – getting a panoramic view of it from the group. This output is not just a 30,000 foot overview, it includes specifics about how the issues affect different parts of the organization and its processes. That established, a solution to the problem can evolve from the discussion. Seems logical that defining the problem and seeking a solution is the better path...so why not travel this route? Problem definition is not fun stuff – it's hard work. And it's risky for the leader or manager to be candid, since solving problems is at the top of their job description – will they be blamed for not doing their job?. On the other hand, the facilitator and participants enjoy the BS of brainstorming – shouting out first thoughts, coming up with would-be solutions (“what's your first thought – no bad contribution here”), having huge pages of notes taped all over the wall – it's a day of thinking fast, responding verbally, and being agile in direction and movement of the discussion – sounds like that marching band. Personally, we get better results when we focus on an issue, and ignore the other 'noise' around us. The same applies when a group collaborates to identify and solve problems. From your post, I realize that brainstorming is a tool, sometimes appropriate (as when everyone has comparable understanding and focus), and sometimes not. And that a lot of these brainstorming divas are like the six year old with the hammer who thinks everything looks like a nail.